I Found My first Dinosaur Toys in 1951 When I Was Six. 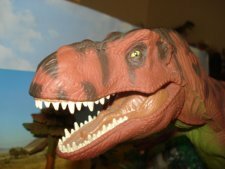 This website will serve as a Dinosaur toys Collectors Guide as it takes you on an ongoing and decades long trip. No one can collect real Dinosaurs (except, perhaps, in the movies) but Dinosaur toys are available to stir the imagination and arouse the little boy (or girl) in each of us. Eventually every "Dinosaur" ever made will be findable here, from Apatosaurs to Velociraptors and Battat to X-Plus, depending on whether you are searching by Dinosaur or company name. I discovered that I could have Dinosaurs of my very own when my aunts first took me to visit the American Museum of Natural History in 1951. I was only six years old and I was entranced by the great fossil exhibits. I could never look at a fossil without clothing it in flesh and imagining its life. The bones of the mighty Tyrannosaurus Rex, Triceratops, Brontosaurus (renamed Apatosaurus years later), the Stegosaurus and the Allosaurs all fired my imagination, came to life and incited a passion in me that burns to this day, nearly sixty years later. The museum shop carried SRG metal figures that were the only such toys available at the time. Over the following years we would visit the museum on average twice a month and I would return home with one, two and sometimes even three SRG figures to play with on the floor of my room. These prehistoric animal toys became central to my play for years after and have accompanied me throughout my life. 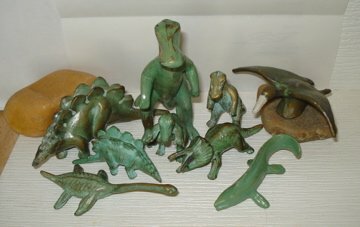 My collection grew in the mid-fifties to include the wonderful MARX prehistoric figures until, today, I have a collection spanning nearly six decades and many manufacturers. I will be sharing that collection with you, here, on this site. Today's models by Battat, Bullyland, Carnegie, Invicta, PAPO, Safari Ltd, Schleich and the Jurassic Park movie action figures among others are a far cry from those of my childhood. The detail and "realism" have increased geometrically from those early SRG and the MARX figures. I have collected them all, and as many as I could, and hope that this site will help those who are interested in collecting these models and interest those who are fascinated with the mind and playfulness of a fairly typical collector. Among the things that you will not find here are Museum Quality (and museum expensive) Dinosaur statues, Dinosaur art, crafts or folk-art. You won't find Dino-jokes (this is a serious site :+)), nor songs, poetry or other what not. You will not find Dinosaurs that cost more than about twenty dollars ($20.00) retail when new. Many of these little gems have since greatly appreciated in value ( Battat comes to mind) but they were not particularly expensive when new and off the shelf. These are toys first and foremost. I do not much like toys that do things for themselves. I do not like toys that stop doing things because the battery dies. I do not like remote-control toys. I do not like toys with moving parts that can break, come apart or get jammed with dirt. I like toys that just sit there, waiting to be animated by my imagination. I like toys that are "realistic" and detailed, rather than fanciful and/or "toylike." I like bi-pedal Dinosaur toys that stand on their own two feet, are well balanced and do not require the tail as a third point of contact in order to stand on their own. I don't like integral "stands" such as little green-army-men have. I like toys that can be buried in mud and washed off with a hose and be ready to be played with under any conditions. Eventually the site will provide a complete listing of toy companies including a complete list of all Dinosaur toys they made in the past sixty years. I will devote a page to each one. What will make this undertaking unique is that all my pictures will be of Dinosaur toys that I personally own. Dinosaurs hunting, exploring and partying around my home. I will include in some of my photos this little statuette of ME (courtesy Schleich), at 2" in height, for purposes of gauging the size of the dinosaur figures (scale would be 1/34). Luckily I am retired now and can devote myself (almost) wholly to the task. I expect to be about 142 when it is completed. As long as no new companies or figures appear in the interim. Information and contributions from readers and visitors is welcome as I know that I neither own, nor know of, every Dinosaur toy made. All contributors will be credited. This site is begun in the hope of helping others in this great, fun hobby and providing a complete Dinosaur toys Collectors Guide. The Dinosaur Toys Collectors Guide blog keeps you updated on the latest changes and additions to this playful picture encyclopedia. Subscribe here. Tyrannosaurus Rexford Dinosaur accepts donations here. Donations will keep Tyrannosaurus Rexford and this site from going extinct. List of Dinosaur Toy Companies including an imperfect List of Dinosaurs they manufacture(d). All you will need to know about the Marx toys Dinosaur toys figure series, produced from 1955 to 1978, and beyond. Probably the most popular dinosaur toys ever made. The creatures that stalked the Permian Period make great Dinosaur toys today. The 2008 Safari Dilophosaurus will ambush your heart and boggle your mind. You'll be easy prey. The Dinosaur Diplodocus toys are among the best replicas today. If you want cute Dinosaurs, just cover them in feathers and make Dinosaur toys out of them. The Duck Billed Dinosaur Hadrosaurus makes a wonderful addition to the family of Dinosaur toys. The Plateosaurus was one of thje largest Dinosaurs of the later Triassic Period. An overview of the Sauropods Dinosaur toys requires a long neck. 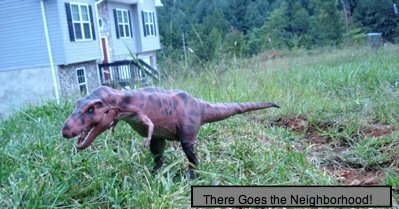 Several companies are making Spinosaurus Dinosaur toys at this time. The Stegosaurus Dinosaur toys are as odd as the real thing. The Stegosaurus was bizarre as are the Dinosaur toys based upon it. The Theropods are the Dinosaur toys your mother warned you about. Dino search is the premier dinosaur toys search engine. Our Contact Us "Contact-osaur-Us" page. The easiest and fastest way for you to contact us. A Dinosaur Planet worth of valuable Dinosaur toys collectors links. This July 4 2011 Rexford discusses the responsibility of the vote, and big teeth. Power Yoga Information and Schedule. Morganton Yoga for the foothills. Morganton Yoga, the fastest hour and a half in town.